While we may at times appreciate the convenience of plastic bags, disposable plastic water bottles, and all of the wonderful new inventions made with plastic, the sad fact is that plastic waste is filling our landfills, creating problems for wildlife, and polluting our planet. 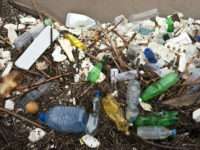 It takes over 400 years for most plastics to break down, and we are using more and more each year. Since production ramped up in the 1950s, only 9% of plastic has been recycled and 12% has been incinerated. This leaves about 79% of the 8.3 billion metric tons produced sitting in landfills or littering our lands, oceans, and waterways. So we need to work together to beat plastic pollution. Reduce your family’s use of single-use plastics (plastic items that are only used one time). Use washable, refillable cups or water bottles instead of disposable plastic water bottles. Use reusable shopping bags instead of taking disposable shopping bags. Use reusable utensils instead of disposable plastic forks, knives, and spoons. Use washable containers instead of disposable bags to store food. Use reusable containers for lunches. Keep plastics out of landfills and nature. Repurpose plastic items. Can that plastic tub be cleaned and used to store something else? There are wonderful reuse ideas; just search the internet. Know what type of plastic items your local recycling program accepts. Recycling plastics reduces the use of virgin materials and creates less waste. Donate useful but unused plastic items to charity instead of throwing them away. Teach your family and friends about the importance of a clean environment. Never litter. Change your way of thinking about plastic. Plastic does not break down for over 400 years. Please keep that in mind when you buy items, especially for short-term use. Do you really need to use a single-use plastic bag or fork when it will still be around in 400 years? Make small changes and encourage others to do the same. Small changes made by many people add up to a big difference. Help create a healthier planet for today’s children and future generations by limiting the number of plastics you use.